← Hibernating for the Winter ?? No just for a few weeks! Is spring here? We are waking up and so are the plants. Spring came this week. We call it the spring equinox. The day and night are each about 12 hours. They are equal lengths of time. We are about ¼ of the way through the year. The garden is still under snow but certainly not in a winters sleep. It may not feel like spring or even look like spring but the signs are there if you are using your close vision. Here are some things to look for and record in your journal. Can you hear or see water running? The snow may be melting even if the temperature is still below zero. At this time of the year the sun is high enough in the sky to warm the snow and cause melting to happen. Look closely at bushes and small trees. The buds on each branch are swelling. They are beginning to grow. As the days become longer the plants are beginning to emerge from a winters “sleep”. They are responding to the length of day and warmth of the sun. 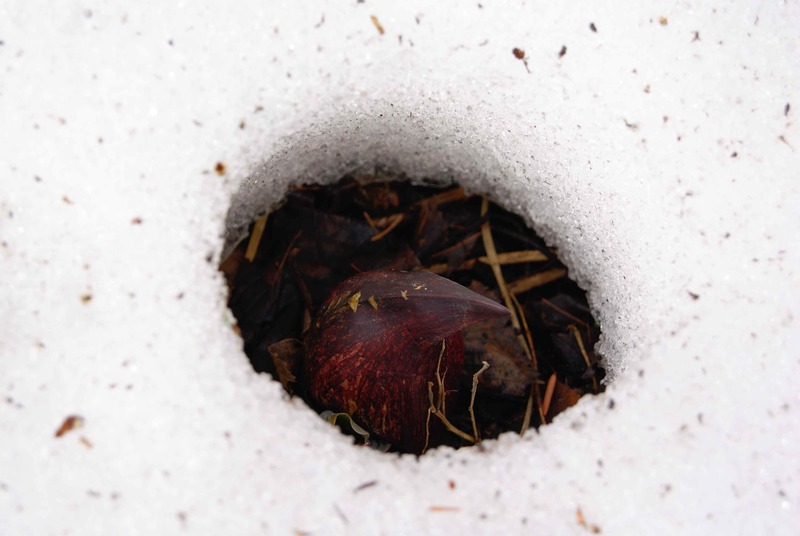 If you are walking in a wild garden (the woods) you might find plants beginning to emerge from the snow. Some plants will grow in the cool of spring and others create their own little heat island. This heat island is called thermogenesis. Skunk cabbage is one of those plants. What other signs of spring can you find and record in your nature journal?